Thank you SO much! You are generous to share this freely and I love your work! These are SO awesome! Thank you, thank you!! Thank you! Have used the creeper juice label for two parties now and have just printed out the goodie bag labels - got candy cones made up in minecraft colours so this was easy peasy! Thank you so much for these. 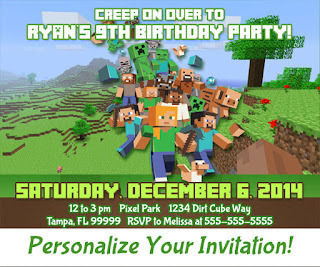 I'm preparing a Minecraft party for my son's 7th birthday, and he sure will love this. Thanks again! THANK YOU SO MUCH!!! You are so awesome!!! Appreciated them all! God bless! Thank you for sharing these printables!! THANK You, THANK You, THANK you!! You're amazing for sharing! Thanks for your generosity in sharing! You're a lifesaver!! The invitations and thank you cards are not free. The others are available to download. Click the download button at the bottom of the post.